Multiple Grade I winner and the richest New York-bred in history Mind Your Biscuits arrived at Churchill Downs early Thursday morning to begin training towards the $200,000 Lukas Classic (Grade III) on Sept. 29, a race that trainer Chad Summers hopes catapults the 5-year-old horse to a Breeders’ Cup victory. 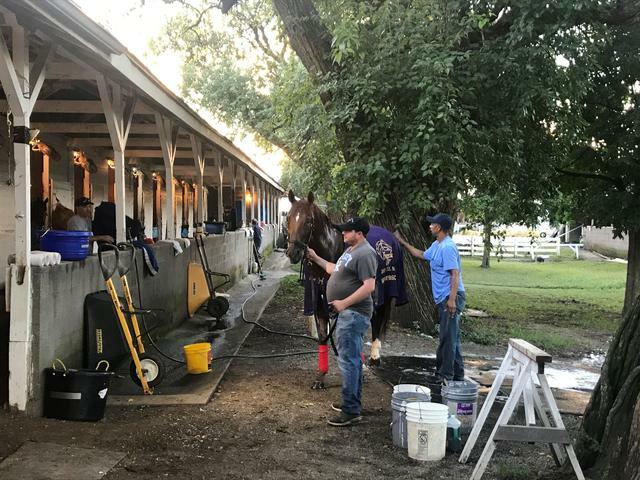 Mind Your Biscuits, a chestnut son of Posse, arrived at Churchill Downs at 3 a.m. (all times Eastern) Thursday and is expected to train at 5:30 a.m. each day and possibly breeze Friday, Sept. 21, according to Summers. Most recently, Mind Your Biscuits finished second in the 1 1/8-mile Whitney (GI) on Aug. 4 at Saratoga behind fellow New York-bred Diversify. “You obviously can’t take anything away from Diversify, he’s a very nice horse,” Summers said. “Dealing with six other owners is a lot of stress on deciding where to run but I’d love to match up against him again in the Breeders’ Cup Classic. I would’ve loved to match up against Justify with this horse, too, but that won’t happen. He’s just a superstar. Mind Your Biscuits competed in the last two runnings of the TwinSpires Breeders’ Cup Sprint (GI) and finished second and third, respectively. Owned by Summers along with partners Shadai Farm, J Stables, Head of Plains Partners, Scott Summers, Daniel Summers and Michael Kisber, Mind Your Biscuits sports a record of seven wins, 10 seconds and three thirds from 23 starts with earnings of $4,159,286. FOLEY SIBLINGS CONFIDENT WITH HOG CREEK HUSTLE AHEAD OF SATURDAY’S IROQOUIS – It was nearly one year ago when Something Special Racing’s Patty Tipton called trainer Greg Foley to help look at horses during the Keeneland September Yearling Sale. One of the horses Greg picked out was Hog Creek Hustle, who will tackle stakes company for the first time in Saturday’s $150,000 Iroquois (Grade III) at Churchill Downs for his older sister and fellow trainer Vickie Foley. Hog Creek Hustle was purchased for $150,000 and debuted on Aug. 18 at Ellis Park. After the colt trailed by nearly six lengths off the early pace in a five-furlong maiden special weight contest, Hog Creek Hustle rallied to narrowly defeat nine rivals under leading rider Corey Lanerie. One of the horses to contend with in Saturday’s Iroquois is 2-1 morning line favorite Tight Ten for Hall of Fame trainer Steve Asmussen. Owned by Winchell Thoroughbreds’ Tight Ten (2-1-1-0—$70,600) broke his maiden impressively by 4 ¼ lengths under Ricardo Santana Jr. on June 28 at Churchill Downs. The homebred spent July and August at Saratoga Race Course and finished a game runner-up behind Call Paul in the Aug. 12 Saratoga Special. The complete Iroquois field from the rail out (with jockey, trainer, assigned weight and morning line odds): Mr Wrench It (Euclyn Prentice Jr., Coty Davidson, 120 pounds, 30-1); Royal Urn (Leonel Reyes, Michelle Nihei, 118, 12-1); Drunk as a Skunk (Joe Rocco Jr., Doug Anderson, 118, 30-1); Tight Ten (Santana, Asmussen, 118, 2-1); My Sixth Sense (Shaun Bridgmohan, Mark Casse, 118, 10-1); Tobacco Road (Julien Leparoux, Asmussen, 120, 6-1); Pole Setter (Florent Geroux, Brad Cox, 118, 6-1); Cairo Cat (Brian Hernandez Jr., Kenny McPeek, 118, 8-1); Manny Wah (Channing Hill, Wayne Catalano, 118, 8-1); Hog Creek Hustle (Lanerie, Foley, 118, 10-1); Synthesis (Drayden Van Dyke, Keith Desormeaux, 118, 12-1); and Everfast (Robby Albarado, Dale Romans, 118, 12-1). TAPPING PEARL HOPES TO REBOUND IN SATURDAY’S POCAHONTAS – Stonestreet Stables Tapping Pearl was one of four 2-year-old winners for trainer Mark Casse during the 2018 Spring Meet at Churchill Downs and head assistant Dave Carroll is hoping the Tapit filly can return to form in Saturday’s $200,000 Pocahontas (Grade II) at the historic Louisville track. “This filly was really impressive in her debut,” Carroll said. “She went to Saratoga for a bit this summer but it was a head scratcher in the Schuylerville (GIII). She’s better than that and I hope she can show that Saturday. Tapping Pearl, who was made 10-1 on odds maker Mike Battaglia’s morning line, broke awkwardly from the gate in the July 20 Schuylerville and finished ninth out of 10 horses. Following her sub-par effort, the homebred returned to Casse’s barn at Churchill Downs to begin preparing for the Pocahontas. Chief among Tapping Pearl’s rivals is 13-length Ellis Park Debutante winner Serengeti Empress for trainer Tom Amoss. However, the Alternation filly also did not draw ideal and will break from the rail as the 5-2 morning line favorite. The field for the Pocahontas, in order of post position (with jockey, trainer, assigned weight and morning line odds): Serengeti Empress (Corey Lanerie, Amoss, 120 pounds, 5-2); Love My Honey (Julien Leparoux, Mike Maker, 118, 6-1); My Wynter Rose (Cory Orm, Tommy Short, 118, 50-1); Profound Legacy (Brian Hernandez Jr., Ian Wilkes, 118, 20-1); Splashy Kisses (Drayden Van Dyke, Doug O’Neill, 118, 4-1); Lightscameraaction (Robby Albarado, Kenny McPeek, 118, 20-1); Include Edition (James Graham, Vickie Foley, 118, 30-1); Two Dozen Roses (Ricardo Santana, Todd Pletcher, 118, 6-1); It Justhitthe Wire (Joe Rocco, Kiaran McLaughlin, 118, 6-1); Taylors Spirit (Shaun Bridgmohan, Scott Gelner, 120, 8-1); Saved At Dawn (Fernando De La Cruz, Brad Cox, 118, 15-1); and Tapping Pearl (Geroux, Casse, 118, 10-1). BLUE PRIZE PREPPING FOR POSSIBLE START IN BREEDERS’ CUP IN SATURDAY’S LOCUST GROVE – Merriebelle Stable’s Fleur de Lis Handicap (Grade II) winner Blue Prize (ARG) will return from a three-month layoff Saturday as the 2-1 morning line favorite in the $100,000 Locust Grove (GIII) at Churchill Downs. “She’s been doing really well and working nearly every week since the Fleur de Lis,” trainer Ignacio Correas IV said. “We didn’t really know where to run her after the Fleur de Lis. We had thought about running in Saratoga but the weather was just so hot. She would’ve had to van 14 hours to and from New York and that was just too much in my opinion. By winning the Fleur de Lis, Blue Prize was awarded an automatic berth to the Breeders’ Cup Distaff (GI) on Nov. 3 at Churchill Downs but was not originally nominated to the race. The ownership group can nominate the 5-year-old mare before the pre-entry deadline on Oct. 22. The 1 1/16-mile Locust Grove, for fillies and mares 3-years-old, is carded as Race 9 on the 11-race program with a scheduled post time of 4:53 p.m. (all times Eastern). The field from the rail out (with jockey, trainer, assigned weight and morning line odds): Streamline (Chris Landeros, Brian Williamson, 123 pounds, 15-1); Champagne Problems (Calvin Borel, Ian Wilkes, 121, 4-1); Blue Prize (ARG) (Julien Leparoux, Correas, 123, 2-1); Dutch Parrot (Joe Rocco Jr., Will VanMeter, 121, 20-1); Pinch Hit (Shaun Bridgmohan, Brad Cox, 121, 4-1); Mannerly (Corey Lanerie, Brendan Walsh, 121, 5-1); Tiger Moth (Florent Geroux, Cox, 123, 10-1); Sailor’s Valentine (Brian Hernandez Jr., Eddie Kenneally, 121, 10-1); and Pacific Pink (Ricardo Santana Jr., Steve Asmussen, 121, 12-1). VERTICAL OAK MADE 7-5 MORNING LINE FAVORITE IN SATURDAY’S $100,000 OPEN MIND – Kirk and Judy Robinson’s recent Honorable Miss (GII) runner-up Vertical Oak was installed as the 7-5 morning line favorite against six other fillies and mares in Saturday’s 10th running of the $100,000 Open Mind at Churchill Downs. Trained by Steve Asmussen, Vertical Oak will face the top two finishers from the June 23 Roxelana – Dreamchaser Thoroughbreds’ Astrollinthepark and Preston Madden’s Miss Kentucky, respectively. The six-furlong Open Mind is scheduled as Race 8 with a post time of 4:21 p.m. The Open Mind field from the rail out (with jockey, trainer, assigned weight and morning line odds): Thirteen Songs (Robby Albarado, Dallas Stewart, 120, 30-1); P Boo (Jack Gilligan, Kirk Harris, 120, 20-1); Vertical Oak (Ricardo Santana Jr., Steve Asmussen, 120, 7-5); Courtmewithcarats (Sammy Camacho Jr., Clarke Vesty, 120, 50-1); Our Majesty (Corey Lanerie, Ron Moquett, 120, 8-1); Miss Kentucky (Brian Hernandez Jr., Rusty Arnold II, 122, 2-1); Astrollinthepark (Gabriel Saez, Larry Jones, 120, 2-1). COURT RETURNS TO ACTION SUNDAY FOLLOWING SHOULDER SURGERY IN LATE JUNE – Veteran jockey Jon Court is set to return to the saddle Sunday at Churchill Downs following shoulder surgery on June 30 after he was injured in a motorcycle accident. A native of Gainesville, Fla., Court has won 4,121 races with purse earnings of $104,087,932 in his 38-year riding career. Now a grandfather, Court has no timetable on how long he will continue to ride. “I’m going to go as long as my body will let me,” Court said. Court is scheduled to ride One Thirty Nine in Race 9 Sunday in a 1 1/16-mile conditioned allowance race for trainer Ed Frederick. Lanerie, Cox, McPeek, Ramseys Defend September Titles – Veteran jockey Corey Lanerie, fresh off of winning the Ellis Park riding title with 30 winners, had the hot hand during last year’s September Meet with a record 25 wins, 15 more than Florent Geroux and Brian Hernandez Jr. Hernandez defeated Geroux, 43-38, during the Spring Meet for his first local leading rider title. Fifteen-time Churchill Downs champion Lanerie was third with 35 wins but missed the final seven racing days following the sudden death of his wife Shantel. Louisville native Brad Cox and Kenny McPeek shared the training title at last year’s September Meet with seven wins apiece. Cox finished second and six wins back of Asmussen during the Spring Meet, who won his record-extending 19th local training title with 30 winners. The leading owners during last September were Ken and Sarah Ramsey of Nicholasville, Ky., who won five races. The couple was victorious in nine races during the Spring Meet to collect their 31st crown as Churchill Downs’ top owners. Overall, they’ve won 487 races beneath the Twin Spires to easily be the track’s all-time leading owners. Racing Thursday-Sunday; First Race 12:45 p.m. Most Days – Churchill Downs’ 11-day meet will be staged over three weekends through Sunday, Sept. 30 with racing on Thursdays, Fridays, Saturdays and Sundays. The first race will be 12:45 p.m. daily (admission gates open at 11:30 a.m.) with the exception of a pair of 5 p.m. (gates at 4 p.m.) Twilight Thursdays and a 6 p.m. first post (gates at 5 p.m.) on Saturday, Sept. 29. Popular 5 p.m. ‘Twilight Thursdays’ Return With $1 Beer, Live Music, Food Trucks, Lawn Games – The two Twilight Thursdays will feature $1 beer, live music (Sheryl Rouse Band on Sept. 20 and Roadie on Sept. 27), food trucks (Flavaville, Red Top Gourmet Hot Dogs, Zoom Zoom Yum, Mark’s Feed Store and Pollo), and lawn games (Snookball, Corn Hole and Giant Jenga) in Churchill Downs’ Plaza from 5-8 p.m.
Family Adventure Day Scheduled for Sunday, Sept. 23 – Family Adventure Day Presented by Kroger is scheduled for Sunday, Sept. 23. Families are encouraged to bring the kids to Churchill Downs for a day of racing and family activities including pony rides, inflatables, petting zoo, stick horse races on the turf course, face painting and more. The theme is “Be Creative!” and special happenings include science activities from The Kentucky Science Center; arts and crafts with Side by Side Studio; a mobile recording studio with AMPED: The Academy of Music Production, Education and Development; practice printmaking basics with KMAC; and interaction with the Kentucky Department of Agriculture. Tickets for adults and children age 3 and up are just $8 when purchased online in advance at ChurchillDowns.com, and include unlimited access to all kid-friendly activities through 5 p.m. Churchill Downs is also offering a Family Four Pack that includes four Family Adventure Day tickets, four family meals in the Family Adventure Day area and two racing programs for only $44 (a $59 package includes reserved box seats). Betting Menu Features 20-Cent Single 6 Jackpot – The betting menu will be the same as recent meets and includes the 20-cent minimum “Single 6 Jackpot,” which is offered on the last six races each day with a low 15-percent takeout. The Single 6 Jackpot will be paid out only if there is a single winning wager with six winners placed at the required minimum bet value. If there are multiple winning wagers with six winners in the six-race sequence, 90 percent of the net money wagering into the pool will be paid out, and the remaining 10 percent will carry to the Single 6 Jackpot. If there are no tickets will all six winners, 100 percent of the pool will carry to the Single 6 Jackpot. There will be a mandatory payout on closing day. ‘INSIDE CHURCHILL DOWNS’ CONTINUES FRIDAYS AT 6 P.M. – Inside Churchill Downs” airs Friday at 6 p.m. on ESPN Louisville’s ESPN 680/105.7. The weekly horse racing radio show is co-hosted by Churchill Downs Racetrack’s Darren Rogers and Kevin Kerstein, and delivers a wide-ranging list of interesting guests, from jockeys, trainers, owners to well-informed handicappers and other industry insiders. Those outside the Louisville radio market can listen live online at http://www.espnlouisville.com.